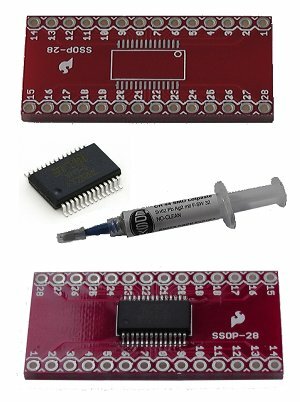 Tutorial to demonstrate the hotplate method of soldering SMD components which we believe is the easiest method for the hobby electronics enthusiast. A typical single element hotplate is shown left. These can be bought online from many stores (including Amazon) for approx £20. As well as showing you lots of pictures at each stage, we also have a video which shows the whole process. So, no toaster ovens, complicated timing or other expensive kit. 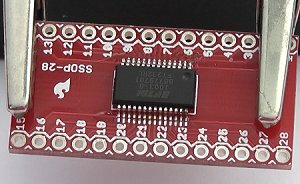 The only other item needed (apart from a Soldering Iron and solder, of course) is a piece of metal (steel or aluminium) that is flat, large enough for your board and fairly sturdy (i.e.not bendy exspecially when hot). 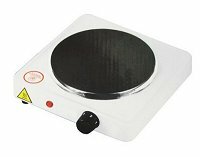 This metal is used to place your board on and off the hotplate and also to act as an even surface for the transfer of heat (many hotplates have ridges or grooves). The Solder Paste we are using here comes in a handy sryinge, but you can just as easily use a tub of solder paste. 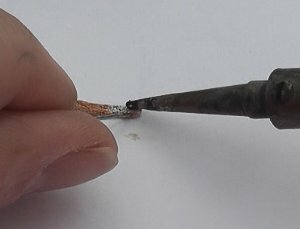 Simply use a craft knife to apply the solder. Place a line of solder paste across each set of pins. It doesn't matter that it connects the pins, as you will see later, when heated it will pull away from the gaps between the pins. Also, don't worry too much about putting too much on. The excess is easily removed later. 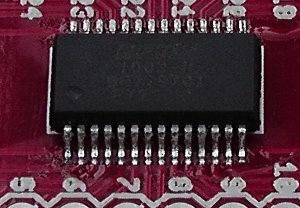 Place the chip on to the solder paste (remember the correct orientation) and make sure it is seated well. 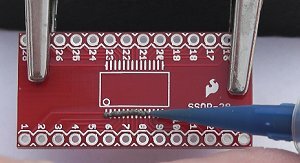 Align the pins as best you can, but when the solder paste melts, surface tension will pull it into place if it is slightly misaligned. Place the board onto your piece of metal and then place on the hotplate. We used a piece of steel - 2mm thick by 2.5cm wide. Turn the hotplate on to its maximum setting. After maybe 3 minutes, depending on your hotplate, you will see the solder paste start to melt. It will go shiny and look more like solder. Surface tension will then start pulling the solder way from the gaps between pins. Quite often though, you are left with some solder bridges as can be seen here. When the solder has finished 'moving', take the metal and board off the hotplate and allow to cool. Don't forget to turn the hotplate off. 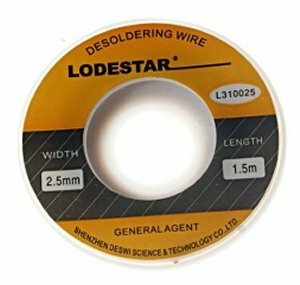 We will be using desolder braid to remove any solder bridges. Desoldering braid is much more useful than a solder sucker tool for this particular job. 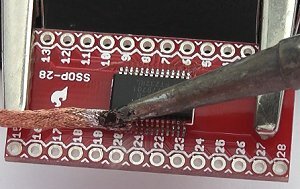 The trick to using desoldering braid is to put some solder on it first. This helps to spread the soldering iron heat throughout the braid. 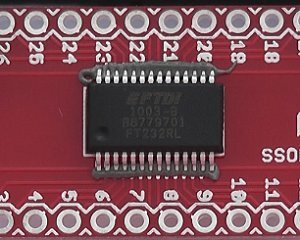 Without the solder you will likely find that the solder bridges on the pins do not melt. Start at one side. 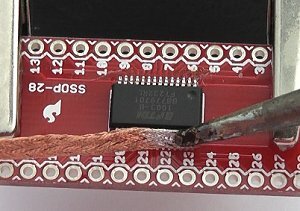 Heat up the desolder braid, and when you see the solder on the braid has melted 'wipe' the braid across the pins with a smooth slow action. 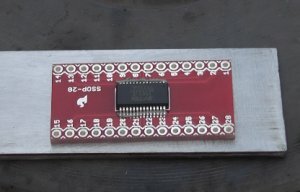 Here we have wiped across the pins and you can see the solder bridges have been sucked up into the braid. If any bridges are not removed in the first pass, just go over them again. This is the end result of removing the solder bridges. Here's the final result, close up. See how the pins have lined up perfectly. Just need to remove the excess flux with some solvent and you're done.